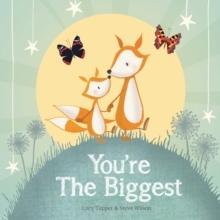 You're The Biggest is a delightful book for a new sibling celebrating their role as the biggest following the arrival of a new baby. The story follows two charming foxes, on a colourful journey, discovering the unique role of an older sibling. Beautifully illustrated in full colour this book is hard backed with cheerful end papers.